Lavendulan: Mineral information, data and localities. Named after the lavender colour of the "type" specimen, which has been determined to be a mixture with no relationship to modern lavendulan (Ondruš et al., 2006). Lavendulan does not exhibit a lavender colour. A polymorph of Lemanskiite, the Ca analogue of Zdenekite and the arsenate analogue of Sampleite. Compare also the chemically and visually similar mahnertite. May appear visually similar to slavkovite. Data regarding this species have been significantly defined in recent years [see Ondruš et al. (2006) and the crystal structure determination by Giester et al. (2007)], including a re-examination of Breithaupt's type specimen. That effort disclosed that the "type specimen" of lavendulan was a mixture unrelated to present-day lavendulan. The second locality from which "lavendulan" was found is Jachymov (Joachimsthal), Czech Republic; therefore, the type locality of the species was changed to the latter locality, pending any formal declarations to the contrary. Space group P21/n. Pseudo-orthorhombic metrics. From ICDD-PDF no. 49-1857 (based on crystal structure). Zinclavendulan Zn-bearing lavendulan (originally thought to be the Zn-dominant analogue of lavendulan). First reported from Tsumeb Mine (Tsumcorp Mine), Tsumeb, Otjikoto (Oshikoto) Region, Namibia. Conichalcite 23 photos of Lavendulan associated with Conichalcite on mindat.org. Azurite 18 photos of Lavendulan associated with Azurite on mindat.org. Lammerite 15 photos of Lavendulan associated with Lammerite on mindat.org. Olivenite 13 photos of Lavendulan associated with Olivenite on mindat.org. Cyanotrichite 10 photos of Lavendulan associated with Cyanotrichite on mindat.org. Ondrušite 8 photos of Lavendulan associated with Ondrušite on mindat.org. Mansfieldite 8 photos of Lavendulan associated with Mansfieldite on mindat.org. Erythrite 8 photos of Lavendulan associated with Erythrite on mindat.org. Magnesiokoritnigite 7 photos of Lavendulan associated with Magnesiokoritnigite on mindat.org. Arsenocrandallite 6 photos of Lavendulan associated with Arsenocrandallite on mindat.org. Breithaupt, A. (1837) Bestimmung neuer Mineralien. 3. Lavendulan. Journal für praktische Chemie: 10: 505-506. Goldsmith, E. (1877) On lavendulite from Chile, S.A. Proceedings of the Academy of Sciences Philadelphia: 192-193. Foshag, W.F. (1924) Note on lavendulan from Joachimstal, Bohemia. American Mineralogist: 9: 29-30. Foshag, W.F. (1924) Freirinite: A new mineral species. American Mineralogist: 9: 30-31. (as freirinite). Palache, C., Berman, H., and Frondel, C. (1951) The System of Mineralogy of James Dwight Dana and Edward Salisbury Dana, Yale University 1837-1892, Volume II. John Wiley and Sons, Inc., New York, 7th edition, revised and enlarged, 1124 pp. : 750-751, 920-921. (as freirinite). Guillemin, G. (1956) Contribution à la minéralogie des arséniates, phosphates et vanadates de cuivre. I. Arséniates de cuivre. Bulletin de la Société Française de Minéralogie et de Cristallographie: 79: 7-95. Ondruš, P., Veselovský, F, Sejkora, J., Skála, R., Pažout, R., Frýda, J., Gabašová, A., and Vajdak, J. 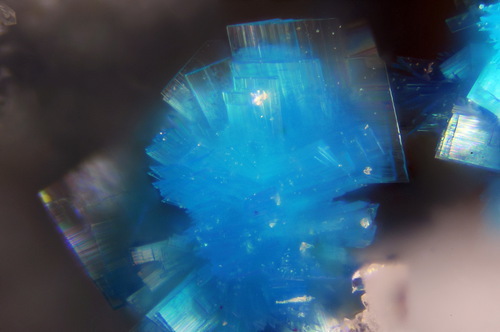 (2006) Lemanskiite, NaCaCu5(AsO4)4Cl•5H2O, a new mineral species from the Abundancia mine, Chile. Canadian Mineralogist: 44: 523-531. (type specimen data). Frost, R.L., Weier, M.L., Williams, P.A., Leverett, P., and Kloprogge, J.T. (2007) Raman spectroscopy of the sampleite group of minerals. Journal of Raman Spectroscopy: 38: 574-583. Giester, G., Kolitsch, U., Leverett, P., Turner, P., and Williams, P.A. (2007) The crystal structures of lavendulan, sampleite, and a new polymorph of sampleite. European Journal of Mineralogy: 19: 75-93. The following Lavendulan specimens are currently listed for sale on minfind.com. Kleeman, A.W. and Milnes, A.R. 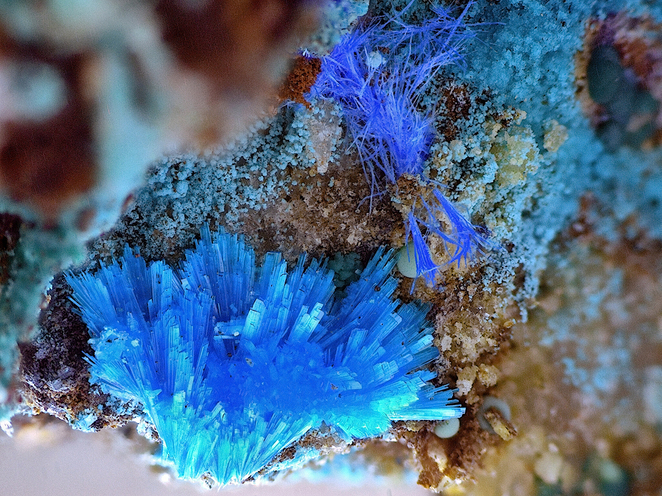 (1973): Phosphorian lavendulan from Dome Rock mine, South Australia. Transactions of the Royal Society of South Australia: 97: 135-137.; Vera Munro-Smith (2006) Cobalt Mineralisation in Selected Australian Deposits. PhD thesis, University of Western Sydney. Brandstätter, F., Niedermayr, G. & Walter, F. (2009): 1575: Ein bisher noch nicht klar zuordenbares Cu-Arsenat aus dem Goldvorkommen am Fundkofel bei Oberdrauburg, Kärnten. In: Niedermayr, G. et al. (2009): Neue Mineralfunde aus Österreich LVIII. Carinthia II, 199/119, 198-199. J.Coordination Chemistry 61,15-29(2008); Paar, W. H., Cooper, M. A., Hawthorne, F. C., Moffatt, E., Gunter, M. E., Roberts, A. C., & Dunn, P. J. (2009). 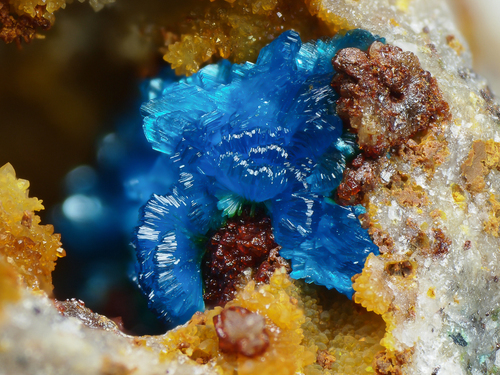 Braithwaiteite, NaCu5 (TiSb) O2 (AsO4) 4 [AsO3 (OH)] 2 (H2O) 8, a new mineral species from Laurani, Bolivia. The Canadian Mineralogist, 47(4), 947-952. Boyle, R.W. (1972) The Geology, Geochemistry, and Origin of the Barite, Manganese, and Lead-Zinc-Copper-Silver Deposits of the Walton-Cheverie Area, Nova Scotia. Geological Survey of Canada, Bulletin 166. Majmundar, H.H. (1969) Ramsdellite and Groutite from Nova Scotia. Canadian Mineralogist: 9: 718-720; Transactions of the Canadian Institute of Mining and Metallurgy and the Mining Society of Nova Scotia: 69: 398. Samples analysed by Tony Kampf of LAC Mineralogical Museum, USA; Kampf, A. R., Mills, S. J., Housley, R. M., Rossman, G. R., Nash, B. P., Dini, M., & Jenkins, R. A. (2013). Joteite, Ca2CuAl [AsO4][AsO3 (OH)] 2 (OH) 2· 5H2O, a new arsenate with a sheet structure and unconnected acid arsenate groups. Mineralogical Magazine, 77(6), 2811-2823.; Kampf, A. R., Mills, S. J., Nash, B. P., Dini, M., & Molina Donoso, A. A. (2015). Tapiaite, Ca5Al2 (AsO4) 4 (OH) 4· 12H2O, a new mineral from the Jote mine, Tierra Amarilla, Chile. Mineralogical Magazine, 79(2), 345-354. Palache, C., Berman, H., & Frondel, C. (1951), The System of Mineralogy of James Dwight Dana and Edward Salisbury Dana, Yale University 1837-1892, Volume II. John Wiley and Sons, Inc., New York, 7th edition, revised and enlarged, 1124 pp. : 921; Josef Vajdak (2002) Mineral News, 18, #1, 6. Kampf, A.R., Nash, B.P., Dini, M., Molina Donoso, A.A. (2013): Magnesiokoritnigite, Mg(AsO3OH)•H2O, from the Torrecillas mine, Iquique Province, Chile: the Mg-analogue of koritnigite. Mineralogical Magazine, 77, 3081-3092. Palache, C., Berman, H., & Frondel, C. (1951), The System of Mineralogy of James Dwight Dana and Edward Salisbury Dana, Yale University 1837-1892, Volume II: 751. Brent Thorne specimen with hlousekite. Walenta, K. (1992): Die Mineralien des Schwarzwaldes. Chr. Weise Verlag, München, 336 pp. (in German); Blaß, G. & Draxler, V. (2015): Babánekit, ein Erstfund für die Grube Clara im Schwarzwald. Mineralien-Welt 26 (6), 16-19. Gröbner, J. & Kloss, D. (2010): Neufunde von der Grube Wolkenhügel bei Bad Lauterberg im Harz. Lapis 35 (1), 39-41; 62. Elbin, K. & Wendel, W. (1996): Lavendulan aus Lavrion. Lapis, 21 (11), 42-43; 62; Hanke, H. (1998): Laurion - ein Rückblick auf die Funde der letzten drei Jahre. Mineralien-Welt, 9 (2), 37-45. Elbin, K. and Wendel, W. (1996): Lavendulan aus Laurion. lapis: 21(11): 42-43. - Balestra C. (preliminary EDS analysis). - Bracco, R. and Balestra, C. (2014): La miniera di Monte Nero, Rocchetta Vara, La Spezia, Liguria: minerali classici e novità. Micro, 12, 1, 2-28. Orlandi P., Criscuolo A. (2009): Minerali del marmo delle Alpi Apuane. Parco delle Alpi Apuane - Pacini Editore, Ospedaletto-Pisa, Italy, 180 pp. Tomasz Praszkier (2010) Lapis, 35, #11, 29-31.
ⓘ La Reconquistada claim (prospect near Dolores mine) ? collected by Brent Thorne; Min Rec 24:1 pp11-22 (mine in general).